XO the Rebellion’s debut independent release ‘Balance EP’ is of the most part a collaboration between Minarmy Producer Hilton and the vocals, concepts, visuals and occasional instrumentation work (the violin and piano on the track Reflections for instance) of Stephen 5N6, Todd DN1 and Closure 7VN who are the alphanumeric sum which makes up XO the Rebellion. The trio of creative and highly skilled British rappers who all come from Luton Town (close to the north of London) are also singers, songwriters and musicians who display their talents well on this incredibly detailed release. 5N6 handles much of the mixing and tracking of their work in-house as well as the directing and editing of their cinematic and often CGI laden visuals which have featured on Link Up TV and their own YouTube channel. For less than five pounds sterling you get six powerful full length 808 driven, modern and soulful hip hop tracks which feature a broad range of instrumentation, from more organic live violin to cutting edge synths and perfectly triggered samples. XOTR paint snapshots of their environment over gritty yet melodic beats laced with intricate and clever lyrics that occasionally break into ambient rooms of natural, full singing vocals on the hooks. The timbre of each artists unique voice and intelligent input is perfectly absorbed into each instrumental piece enticing the audience to enter their sonic landscape. Finalised by world renowned Master Engineer Paul Ashmore using his detailed master chain of analog hardware, the two eras of sound are married perfectly; the vintage world of tubes, transistors and old school circuitry warms and colours the young artists cutting edge digital soundscape with perfect balance. Paul is credited with audio mastering for motion pictures such as the Amazing Spiderman as well as the latest X-Men Wolverine film. He has also worked with global brands like YMCMB and Warner Brothers, therefore his ear and own taste for cinematic beauty and experience handling hard hitting US trap have been an excellent match for this project. XOTR’s first music video taken from the EP ‘Visions’ which was released on Christmas Eve on Link Up TV and which was selected as the featured video for December 2014 on their website thelinkup.com, has reached almost ten thousand plays in only a few weeks of release. XOTR have now freshly dropped their unique special effects visual for ‘Knight Mare’ which is also out on Link Up TV and is gathering lots of plays and positive feedback online from music fans and tastemakers alike. 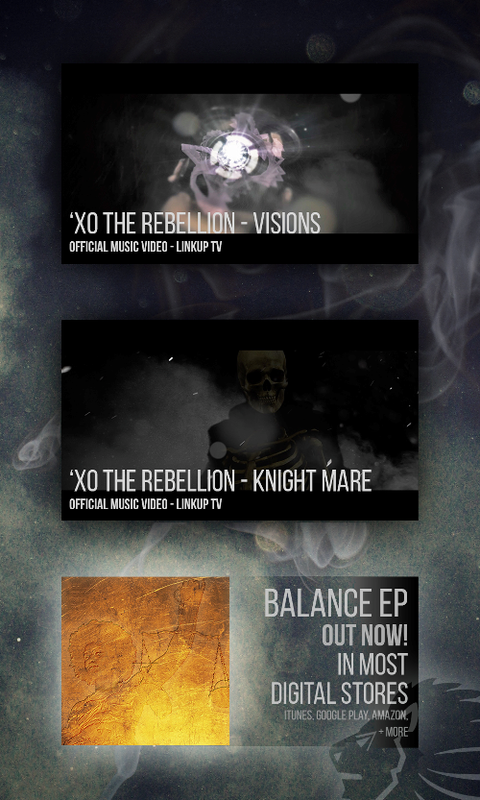 XO the Rebellion’s debut EP: ‘Balance’ is out now in most major digital outlets iTunes, Google Play, Amazon, and many others!